That means organizations still face the consequences of an asset failure when it happens. As we mentioned in our last blog, Spoiler Alert, this typical failure scenario occurs when asset performance degrades until failure occurs and an organization has a reactive response and implements a break-fix solution. 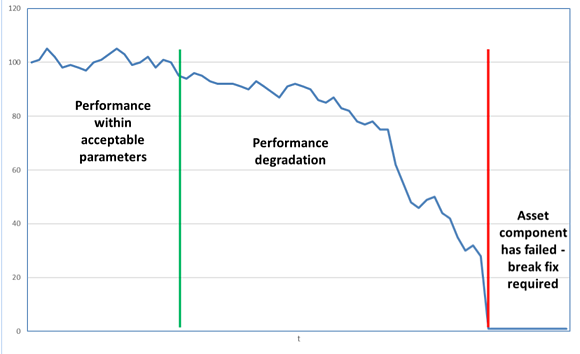 What happens though if the performance does not degrade to the point of failure or alarm? While assets may lack the ability to repair themselves, sometimes the problem goes away or does not get any worse. It's true, not all problems with an asset lead to failure. Sometimes, an issue just causes an acceptable short-term production or performance hit. This means that the issue causes the asset to underperform in such a way that it falls below the organization's set standards for acceptable performance or production levels. This is the case, for example, when an upstream, leading problem creates an issue in the lagging or downstream processes, causing the process and its related assets to appear to underperform. A situation like this may be acceptable in the short term, but too often, this sort of situation continues for "too long" or the problem persists even after the original contributing condition has been addressed. When this happens, the once acceptable short-term issue is no longer acceptable. The key to keeping this sort of underperformance from causing major delays or loss is effective condition monitoring and maintenance planning. Just like if you knew when your asset was going to fail, if you know and understand that your asset has experienced a persistent drop in performance, you can plan for maintenance in the most effective way possible. 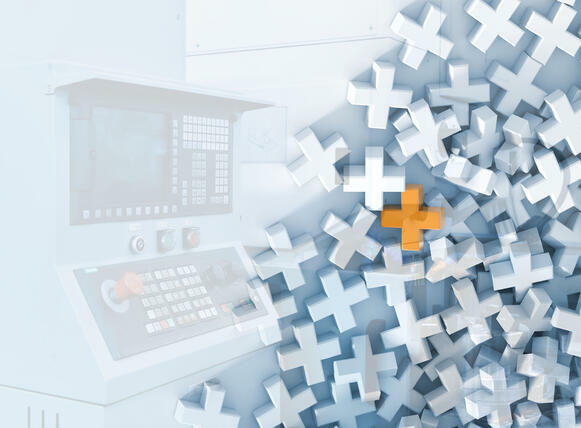 Having the ability to plan for maintenance means you can avoid the backlog and scheduling problems that arise when assets experience problems unexpectedly. The more you can avoid this, the faster you can get everything back up and running to acceptable or ideal performance standards. Essentially, what all of this boils down to is: if you don’t measure it, you can’t manage it or the more you know about your assets' performance, the more effectively you'll be able to plan for maintenance. So how do you get the most, and the best, knowledge about your asset performance? Our flagship solution is the Dexcent Asset Analytics System (DAAS). 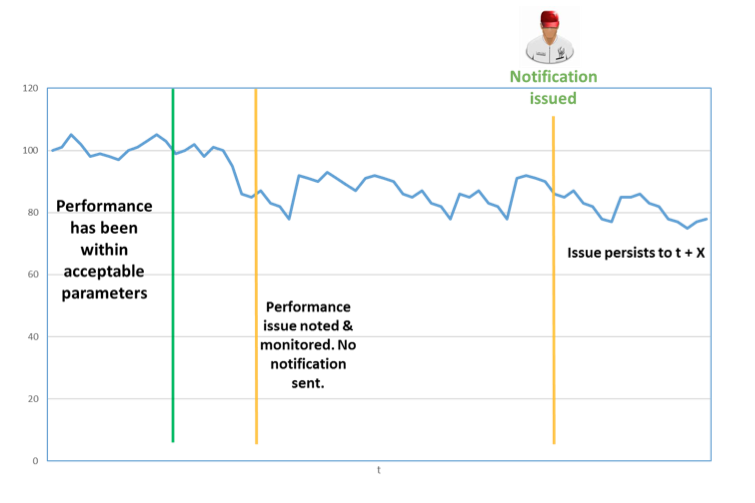 DAAS cumulative condition monitoring addresses those situations where a drop in performance is acceptable in the short term, but when it goes on too long, or persists after the contributing condition has been rectified, it becomes an issue. How does it work? In the simplest terms, DAAS monitors the condition of assets and notices when they begin to experience an issue. But, DAAS understands that not all performance issues need to be addressed immediately. Some will return to acceptable levels after a short time. So, the asset or process continues to be monitored, and if the issue persists for a time period deemed no longer acceptable or short-term, a notification is issued. When this happens, the recipient will know that scheduled maintenance is required to bring the asset back up to acceptable performance levels. This unique monitoring and notification system allows you to schedule and perform asset maintenance effectively and efficiently. If your organization is interested in acquiring the DAAS advantage, contact Dexcent today.